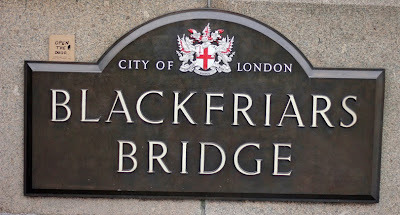 As we inch our way along the south bank of The Thames, Stuart and I have been aware of the changing architecture, there seems to be a never ending carousel of buildings sites where voids are miraculously filled by taller and taller creations. Amongst them are those landmarks that have been here for centuries, yet are unashamedly taken for granted. 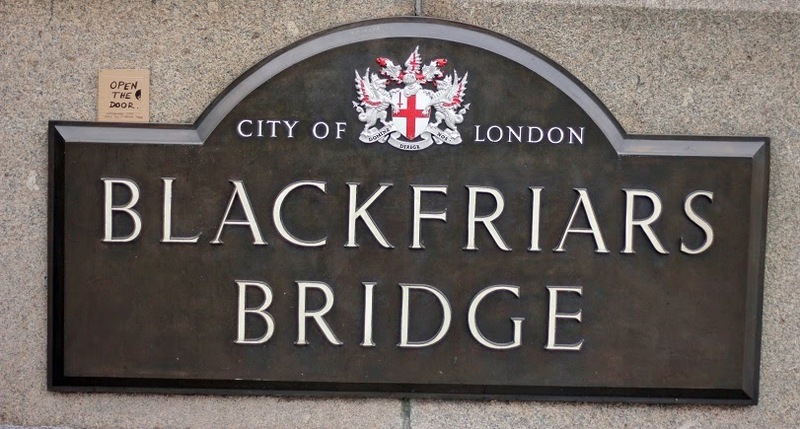 Blackfriars Bridge for instance was built in 1869 and was opened by none other than Queen Victoria. Today this is where we find artist Siobhan Tarr's entry behind door number 12 and it has been opened by someone who is just a little less famous than her majesty. 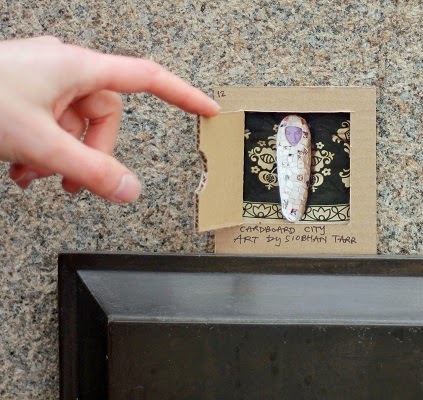 Siobhan Tarr is a well travelled bundle of creativity. Born in England, she lived many years in Australia before settling in Germany. It is from her base in Bad Oldesloe that she commands her mosaic empire, sending her reconstructed creations out into the world. She has been exhibiting with us since Lightbite, the magnetic street art exhibition in Nottingham (2011). I have been a great admirer of her work ever since but it is her desire to break the rules as well as the tiles that keeps me captivated. 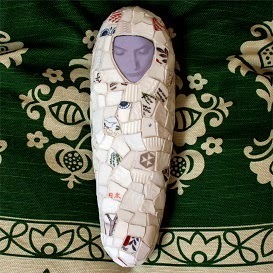 Once again Siobhan Tarr stretches the boundaries with her submission, "Cocoon". A mosaic that is released from its normal flat confines but still speaks to us of containment. The form is unmistakably sarcophagus, its digit shape representing death itself. There is a serenity in the face that peeks out, she is at peace even though she is wrapped in her broken dreams, or perhaps a shattered life. I feel a kinship with Siobhan Tarr's image, although I do not publicise my insecurities and shortcomings I do not hide them either. They are part of an exoskeleton that is broken and pitted but hopefully has a fascination too.